Live! From the 2017 Chicago Auto Show! 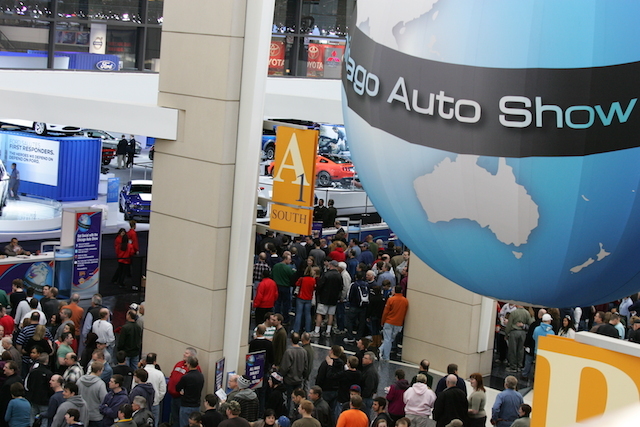 The 2017 Chicago Auto Show opens this Sat. at McCormick Place. The third of four major North American auto shows gets underway this week when the Chicago Auto Show opens to the general public. Running from Feb. 11-20, this year’s show will once again be held at McCormick Place on South Lake Shore Drive. And this year I’ll be in attendance for the first time, bringing updates as they happen. The media preview days are on Thursday and Friday, with 15 automakers making presentations. There will also be a few events on Wednesday, including the Concept & Technology Garage, providing what the organizers say will be a “deeper dive” into all things concept cars, safety technologies, and automotive telematics. Immediately following that event will be the first previews of the auto show as sponsored by Nissan. But as is common to auto shows in the 21st century, the first previews have already happened. 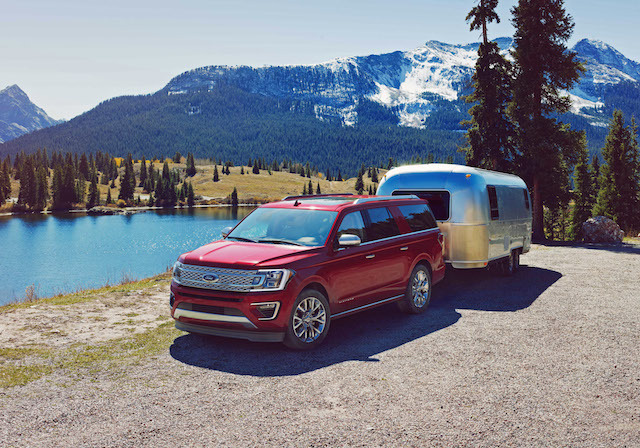 The 2018 Ford Expedition will offer excellent pulling power. 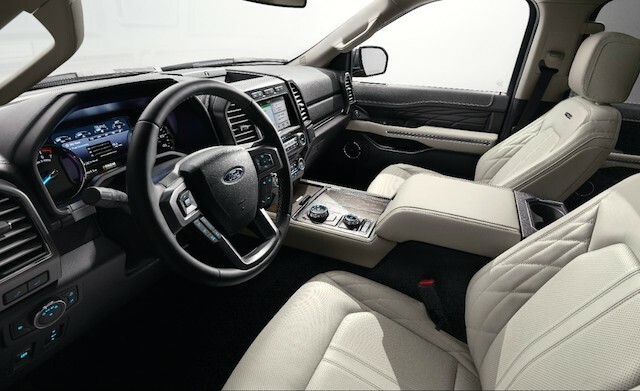 Indeed, Ford rolled out an all-new Expedition SUV at an event in Dallas, timed to coincide with the Chicago Auto Show. The eight-passenger Ford Expedition is four inches longer than the current model, but comes in approximately 300 pounds lighter. An aluminum-intensive body is responsible for some of that lightweighting in a vehicle built on top of a high-strength steel frame. The large SUV market is growing and is dominated by a pair of GM twins: the Chevrolet Tahoe and Suburban and the GMC Tahoe and Tahoe XL. The Dodge Durango is another model customers have been turning too, but the 2018 Expedition along with its larger GM counterparts have more interior room and offer superior towing. Ford’s 3.5-liter, V6 EcoBoost engine returns, but it will now be paired with a 10-speed automatic transmission. This means we should see a nice boost in fuel economy from the current 15 mpg in the city and 21 mpg on the highway. As before, rear-wheel drive is standard and four-wheel drive is available. An all-new interior includes numerous storage compartments. Other standout features include a panoramic vista sunroof, power points for every passenger, SYNC 3 with Apple CarPlay and Android Auto, a Wi-Fi hotspot, wireless charging, and a 12-speaker B&O audio system. A cargo management system and an available dual-headrest rear seat entertainment system are other features. The 2018 Ford Expedition will be available in three grades: XLT, Limited, and Platinum. Arriving this fall, the truck will be manufactured in Louisville, Kentucky. Photos courtesy of the Ford Motor Company. The Dodge Durango is a three-row SUV, sharing its platform and many components with the two-row Jeep Grand Cherokee. It is the largest SUV sold by Fiat Chrysler, offering room for eight. For the first time ever, a high-performance SRT version arrives to the market, powered by a naturally-aspirated 6.4-liter V8 engine. No, this isn’t the same supercharged V8 powering the Hellcat — that one displaces at 6.2 liters and makes more than 700 horsepower. 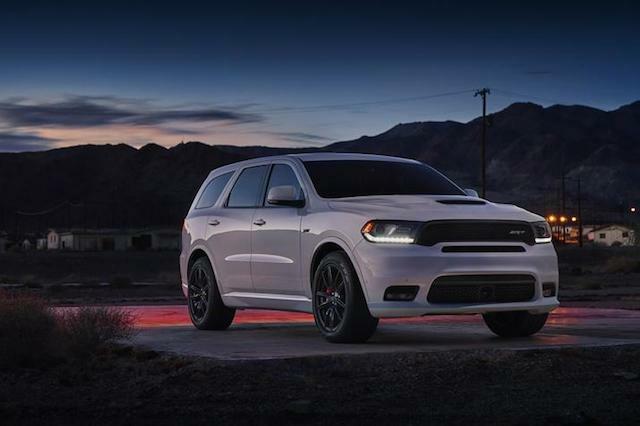 Still, with 475 horsepower and 470 pound-feet of torque at the ready, the 2018 Dodge Durango SRT shouldn’t be easily dismissed. This engine is paired with an 8-speed automatic transmission. The new trim arrives late this year. Customers who opt for one will receive one full-day session at the Bob Bondurant School of High Performance Racing. That session will come in handy as the SRT features a blistering 0-60 mph time of 4.4 seconds and completes the quarter mile in just 12.9 seconds. Who knew that a family vehicle could be so fun? Among the many features of the Durango SRT is a new sport mode that reduces shift times by up to 50 percent versus Auto Mode. It delivers up to 65 percent of the engine’s power to the rear wheels of the all-wheel drive machine. The SRT also comes with stiffer front and rear springs, a stiffer rear sway bar, massive Brembo high-performance brakes, Pirelli performance tires, and a 180-mph speedometer. The usual badging and trim embellishments are offered too. Photo courtesy of Fiat Chrysler. Refreshed Subaru Legacy debuts ahead of the Chicago Auto Show. Midsize sedan interest continues to wane as customers shift to crossovers and other body styles. When 2017 comes to an end, the perennial best-selling model in America, the midsize Toyota Camry, will likely cede its position to one of a trio of compact crossovers, including Toyota’s own RAV4. Subaru has seen much success over the past eight years, doubling sales as customers are attracted to such SUVs as the Outback, Forester, and the Crosstrek. But Subaru shoppers have been showing increased interest in the brand’s midsize Legacy sedan as sales rose by 8 percent last year in a slumping segment. The current-generation Legacy was rolled out in 2014. For 2018, it’ll receive several updates, including refreshed front and rear fascias, an updated center console, standard Apple CarPlay and Android Auto, as well as a quieter and smoother ride. Although not one of the changes is especially dramatic, together they demonstrate Subaru’s commitment to this midsize model. The Legacy will continue to be powered by a pair of BOXER (horizontally-opposed) engines. The standard bearer is a four-cylinder displacing at 2.5 liters. Also available is a 3.6-liter six-cylinder engine. Both are paired with a continuously variable automatic transmission. 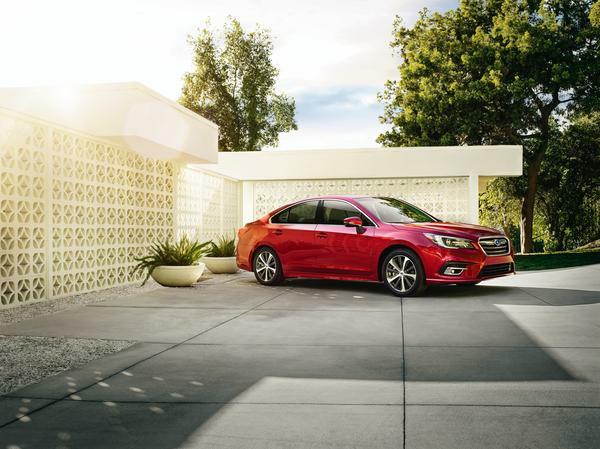 A big advantage offered by the Subaru Legacy is standard all-wheel drive. It provides an extra measure of handling advantage as torque is sent to the wheels as they slip. In this class, only the Ford Fusion offers all-wheel drive — and only as an option on top trim models. Other models with this option have since been discontinued — the Chrysler 200 and Suzuki Kizashi. What helps Subaru stay relevant is that the Legacy shares its platform with the popular Outback crossover. We think the refreshed Legacy will continue to pull in additional customers, regardless of what happens to the segment. Also helping matters is that the cabin is one of the largest in the segment, offering ample room and comfort for five adults. Lastly, Subaru’s winning formula is enhanced by its stellar safety ratings, typically earning a 5-star rating from the federal government and a Top Safety Pick+ rating from an insurance safety consortium. Photo courtesy of Subaru Motors. Nissan spokesman Fred Diaz introduces the Titan King Cab. Nissan has been working diligently these past few years by updating its full-size pickup truck line. More than a year ago, Nissan rolled out its Titan XD line, full-size models straddling the light- and heavy-duty divide. A crew cab version was later joined by a single cab for a model line powered by V8 gas and diesel engines. Once the Titan XD took hold, the standard Nissan Titan was rolled out. Initially, Nissan offered a crew cab model, then followed with a single cab. Missing from both was an extended cab model, but come this spring, a king cab model will officially complete the Titan/Titan XD model line. The all-new King Cab will be available for both the Titan and Titan XD and come with a 6.5-foot bed. 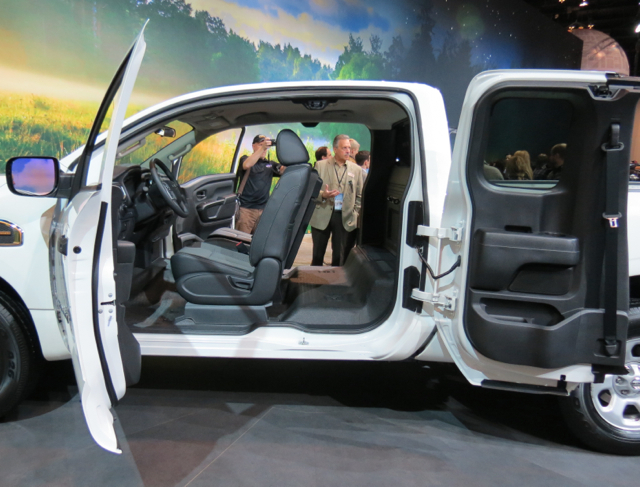 This truck has a rear hinged door design with a wide-opening feature for ease of access to the second row. Customers can choose to include the second-row seat or delete same for additional interior storage space. According to Nissan spokesman Kevin Rafferty, Nissan is the only manufacturer with the rear seat option. Both the Titan and Titan XD King Cab will be available in three grades — S, SV, and PRO-4X. Both 4×2 and 4×4 configurations are available. The standard engine is a 5.6-liter, gasoline V8. 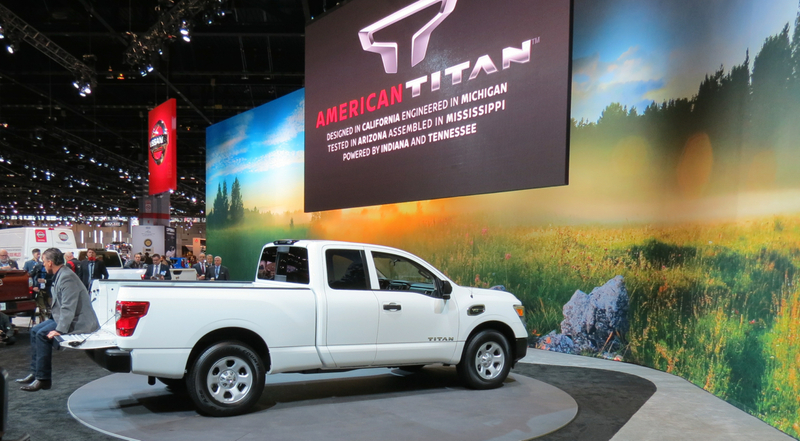 However, Titan XD shoppers will have an additional choice: a 5.0-liter, Cummins V8 turbo-diesel. Both engines are paired with a seven-speed automatic transmission. Rear-hinged rear doors and a delete seat option. Photos copyright Auto Trends Magazines. No new Chevrolet models were introduced at the 2017 Chicago Auto Show, but a concept trim package was released. This Redline special edition series was originally introduced at the 2015 SEMA Show in Las Vegas and will be available on nine models by the end of the 2017 calendar year. The nine affected vehicles are: Cruze LT (sedan and hatchback), Malibu LT, Camaro LT/SS (coupe and convertible), Trax LT, Equinox LT, Traverse Premier, Colorado LT, Silverado Double Cab LT Z71 and the Crew Cab LTZ Z71. This Chevrolet Camaro has gotten the Redline treatment. Chevrolet says, “All Redline vehicles are equipped with black wheels featuring distinct red hash marks, black nameplates with a red outline, blacked-out grilles and black Chevrolet bowtie logos.” Other embellishments depend on the model, including red tow hooks for the Silverado and Colorado. 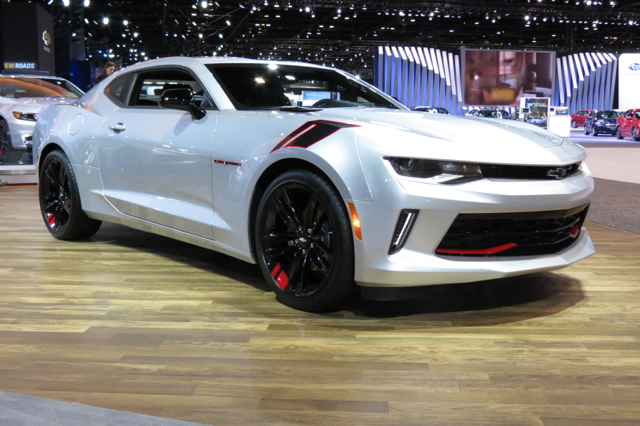 The Camaro Redline edition features unique black hash marks above the wheels for a design enthusiasts will recognize from motorsports. The first Redlines available are the Silverados with other models to follow throughout the year. Check with your dealer for availability and ordering. Photo copyright Auto Trends Magazine. Korean manufacturer advances its green car initiative as consumer demand wanes. Kia Motors America has been relatively quiet in the hybrid electric vehicle arena, trailing most other major brands with only an Optima Hybrid to show for it. However, that’s all about to change as Kia introduced a trio of new hybrid models at the 2016 Chicago Auto Show this week. One of those models is the second-generation Optima Hybrid, joined by a plug-in variant of the same. Even though these two models are important, it is the third model that may be the most intriguing — a Kia Niro crossover utility vehicle, designed exclusively as a hybrid, one with the intrepid Toyota Prius fixed in its crosshairs. Indeed, Kia calls the Niro a key component in the company’s Green Car Roadmap. Importantly, the Niro offers a traditional design, eschewing the usual bubble-shaped theme common to humble hybrids such as the Prius, Honda Insight, and other models that have gone before it. The hybrid’s most significant attribute may be the Niro’s projected 50 mpg combined fuel economy rating, matching Toyota and besting all other rivals. 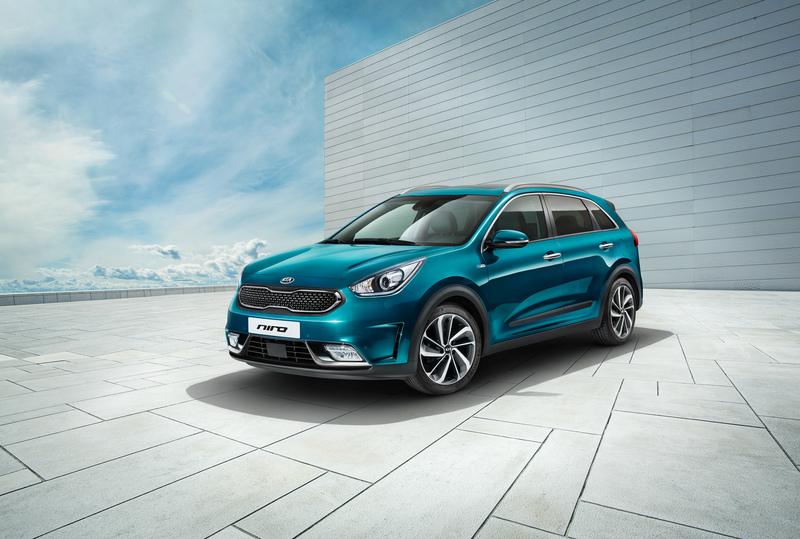 The Niro is a product of Kia Motors EcoDynamics, a sub-brand tasked with advancing this manufacturer’s hybrid blueprint. Prior to the Niro, the development group was responsible for the first-generation Optima Hybrid and the Soul EV. More models will follow, allowing Kia to triple its green car fleet by 2020. Kia tapped a pair of design studios to collaborate on the Niro’s design and execution — Irvine, California, and Namyang, Korea. Notably, the designers chose a design that is at once familiar as it is sporty — the brand’s familiar tiger-nose grille amplifies the front fascia. Body sculpting in the form of robust embrasures up front and along the profile gives this model a sporty look. Strong shoulders, a rising belt line, upper character lines, a sweeping roof line and large wheel wells are also present. From the rear, a liftgate spoiler, wraparound combination lamps with distinct LED lights, reflector lights and bumper garnishment is present. Inside, Kia went with a high-tech and cutting-edge interior satiated with available safety features, including blind spot detection with rear cross traffic alert, lane change assist, lane departure warning, advanced smart cruise control, and autonomous emergency braking. The interior is dressed in glossy white or black accents with a clean and uncluttered instrument panel, chromatic and informational gauges, and strategically placed secondary controls. Sitting on a 106.3-inch wheelbase, the Kia Niro is slightly longer between the wheels than models such as the Toyota RAV4, Ford Escape, and the Honda CR-V. The model’s wide stance, tall height and roomy interior provides generous room for five and ample cabin space to augment it. Under the hood is an all-new 1.6-liter, four-cylinder engine making 103 horsepower and operating on the Atkinson cycle. A 43-hp tractive motor makes for a combined 146 horsepower and 195 foot-pounds of torque. Turning the wheels is a 6-speed dual-clutch transmission. Under the rear seat is a compact lithium-ion polymer battery pack. The 2017 Kia Niro debuts in the fourth quarter of 2016. Approximately one year later, a plug-in version will follow. Meanwhile, in Optima land, Kia’s midsize hybrid sedan should see a 10 percent in fuel economy due largely to replacing the previous 2.4-liter, four-cylinder engine with one displacing at 2.0 liters. Gone is the original torque converter and in its place is a 38-kilowatt electric motor and clutch. Kia claims the latest version will provide a combined 193 horsepower. Unquestionably the fuel economy leader here will be the PHEV Optima. As the brand’s first-ever plug-in hybrid, it has a tall order to fill. One of the electrified sedan’s key attributes is its 600-mile driving range, including operating in EV-only mode for approximately 27 miles. Certainly, Kia’s green initiative comes at a time when Americans are moving away from fuel-efficient vehicles toward SUVs and pickup trucks. This current automotive trend is urged on by low fuel prices, including some of the lowest we have seen this century. Still, automakers are banking on fuel prices eventually rising as well as finding different ways to meet ever more stringent EPA corporate average fuel economy numbers. 2017 Kia Niro photo copyright Kia Motors America.